KUALA LUMPUR, Feb 5 (Reuters) - India halved its palm shipments this week after two months of frenzied buying, while top consumer China stayed on the sidelines as traders assess whether stocks need to be replenished after the Lunar New Year. India, the second largest vegetable oil importer after China, struck deals to buy 20,000 tonnes of palm oil products at $535-$555 a tonne C&F (cost and freight), and shipments are expected to taper off for the rest of February. The South Asian country usually buys 55,000 a week, which include a mix of crude palm oil and refined palm olein. "India imported more than half-a-million tonnes in the last two months and now there is a price disparity between imported oils and domestic sources," said a top Indian dealer. Even state-run trading companies slowed their purchases with MMTC Ltd (MMTC.BO: Quote, Profile, Research) and State Trading Corp of India Ltd. (STCI.BO: Quote, Profile, Research) issuing much smaller tenders for palm oil, which is produced mainly in Indonesia and Malaysia. "Part of the slowdown in Indian imports is due to the incoming rapeseed crop and the fact that prices are not going move very wildly in the next few weeks," said a Malaysian trader with dealings in India. Rapeseed output in India is initially estimated to be around 6 million tonnes in the current oil year starting in October, up 20 percent from the previous year, industry officials say. "The increase is significant because the rapeseed hectarage has increased by more than 10 percent because farmers wanted to take advantage of the high oilseed prices last year," said B.V. Mehta, executive director of the Solvent Extractor's Association of India. Rapeseed oil prices have been mostly steady this week at 980 -1,050 rupees ($20-$20.11) per 15-kg tin as trading was light in Jaipur, the capital of the northern state of Rajasthan where most of the rapeseed is harvested, Indian dealers said. India grows two oilseed crops, mainly soybean and groundnut in the winter season, and rapeseed and groundnut in the summer season. China was mostly unsighted in palm oil markets as traders needed to assess the drawdown in stocks after the Lunar New Year holidays last month. But exporters in Malaysia and Indonesia said China would need more palm cargoes in the next few months as the vegetable oil is better for cooking in the summer season than soyoil. "There is interest in buying palm oil but the deals will start coming in next week when most of the trading companies are back in action after the long Chinese New Year holidays," said the head of palm oil trading at an international house in Malaysia. One trade source said Chinese traders would usually buy more than 250,000 tonnes of refined palm olein per month from Malaysia, starting in March, with demand slowly edging up in February. China bought around 155,690-170,680 tonnes of palm oil in January, cargo surveyors Intertek Testing Services and Societe Generale de Surveillance said last week. Physical crude palm oil prices in Malaysia have risen roughly 5 percent to 1,870 -1,880 ringgit ($518-$521) per tonne for February delivery from last week on fars of tight supply and increased hedging on the uncertain crop outlook in South America, traders said. Feb. 5 (Bloomberg) -- Gold rose the most this week on speculation the global recession will boost demand for precious metals as a store of value. Silver also gained. Goldman Sachs Group Inc. said yesterday gold will rise to $1,000 an ounce within three months, up 43 percent from the bank’s previous forecast. Investment in the SPDR Gold Trust, the biggest exchange-traded fund backed by bullion, rose to a record 859.5 metric tons yesterday. Gold has rallied 34 percent after touching a 13-month low on Oct. 24. Gold futures for April delivery rose $12, or 1.3 percent, to $914.20 an ounce on the Comex division of the New York Mercantile Exchange, the biggest gain since Jan. 30. The metal climbed 1.1 percent yesterday. Silver futures for March delivery rose 28 cents, or 2.2 percent, to $12.75 an ounce. The metal has climbed 13 percent this year, while gold is up 3.4. The SPDR Gold Trust is the seventh-largest holder of bullion behind central banks and the International Monetary Fund, according to data from the World Gold Council. The U.S. Federal Reserve is the largest holder. Assets in the SPDR Gold Trust rose 8.1 percent in January as the price of gold gained 5 percent. The Standard & Poor’s 500 Index lost 8.6 percent last month, while the Reuters/Jefferies CRB Index of 19 raw materials declined 4 percent. Governments worldwide are lowering interest rates and spending trillions of dollars to revive their economies, which will lead to inflation and boost gold’s allure, said Philip Gotthelf, the president of Equidex Brokerage Group Inc. in Closter, New Jersey. The Bank of England today slashed its benchmark lending rate to 1 percent, the lowest ever. The Federal Reserve last month kept the overnight lending rate at zero to 0.25 percent. The U.S. Senate is weighing a stimulus package that tops $900 billion. Since the second half of 2007, banks worldwide have posted more than $1 trillion in writedowns and losses related to the credit crisis. Platinum futures for April delivery rose $12.30, or 1.3 percent, to $982 an ounce on the Nymex. Palladium futures for March delivery gained $4.20, or 2.1 percent, to $202.20 an ounce. Earlier, the price reached $205.90, the highest since Jan. 7. Feb. 5 (Bloomberg) -- Crude oil rose and gasoline climbed to a 12-week high after a government report showed U.S. fuel consumption increased and the stock market rallied. Demand for fuels during the past four weeks averaged 19.5 million barrels a day, up 0.6 percent from the average a week before, the Energy Department said yesterday. Oil gained as much as 2.3 percent after equities rebounded and an analyst predicted Goldman Sachs Group Inc. and Morgan Stanley will repay the government funds they received. “The consumption numbers in yesterday’s report are being taken as a sign by some that the worst is over,” said Bill O’Grady, chief markets strategist at Confluence Investment Management in St. Louis. Crude oil for March delivery rose 85 cents, or 2.1 percent, to $41.17 a barrel at 2:47 p.m. on the New York Mercantile Exchange, the highest settlement since Jan. 30. Prices are down 7.7 percent this year and 53 percent from a year ago. Gasoline futures for March delivery climbed 5.64 cents, or 4.6 percent, to $1.2748 a gallon in New York, the highest settlement since Nov. 13. Heating oil increased 4.02 cents, or 3 percent, to end the session at $1.3672 a gallon. The average U.S. pump price of regular gasoline rose 0.7 cent to $1.907 a gallon, AAA, the nation’s largest motorist organization, said on its Web site today. Prices have declined 54 percent from the record $4.114 a gallon reached on July 17. Goldman Sachs and Morgan Stanley led financial companies in the S&P 500 to a 3.8 percent advance. David Trone, an analyst at Fox-Pitt Kelton Cochran Caronia Waller, said the securities firms will repay the $10 billion they each received from the U.S. government as soon as possible. The S&P 500 rose 1.6 percent to 845.85. The index lost as much as 1.5 percent in early trading after initial jobless claims unexpectedly jumped to a 26-year high. U.S. crude-oil supplies increased 7.2 million barrels to 346.1 million last week, according to the Energy Department. Inventories have gained in 17 of the past 19 weeks, leaving stockpiles 15 percent higher than the five-year average for the period, the department said. Brent crude oil for March settlement rose $2.31, or 5.2 percent, to end the session at $46.46 a barrel on London’s ICE Futures Europe exchange. Brent futures traded at a $5.29 premium over West Texas Intermediate, the crude oil grade that’s traded in New York. “European crude is tighter than U.S. crude, and that should support Brent relative to WTI,” said Mike Wittner, head of oil research at Societe General SA in London. The price of oil for delivery in April is $4.59 a barrel higher than for March, up from a $3.92 premium yesterday. December futures are $13.90 higher than the front-month contract, versus $13.29 yesterday. This structure, in which the future month’s price is higher than the one before it, is known as contango, and is often an indicator of oversupply. Volume in electronic trading on the exchange was 401,089 contracts as of 3:10 p.m. in New York. Volume totaled 474,433 contracts yesterday, down 3.6 percent from the average over the past three months. Open interest yesterday was 1.24 million contracts. The exchange has a one-business-day delay in reporting open interest and full volume data. U.S. unemployment climbed to 7.5 percent, and payrolls fell by 540,000, the 13th consecutive decrease, according to the median estimate in a Bloomberg News survey before Labor Department figures tomorrow. The Organization of Petroleum Exporting Countries decided on Dec. 17 to trim production by 9 percent beginning on Jan. 1. The 12-member group pumped an average 28.565 million barrels a day last month, down 1.05 million from December, according to a Bloomberg News survey of oil companies, producers and analysts. Feb. 6 (Bloomberg) -- The yen traded near a four-week low against the dollar as a gain in U.S. stocks reduced demand for the Japanese currency as a haven from financial turmoil. The pound rose yesterday to a two-week high versus the greenback on bets the Bank of England will pause in cutting borrowing costs after it reduced its benchmark rate to a record low of 1 percent. The euro traded near a two-month low after European Central Bank President Jean-Claude Trichet signaled he may cut interest rates next month. U.S. payrolls fell by more than a half million, a report is forecast to show today. “People are jumping on risk trades,” said Brian Kim, a currency strategist at UBS AG in Stamford, Connecticut. Japan’s currency traded at 91.17 per dollar at 7:09 a.m. in Tokyo, after falling 2 percent yesterday. It broke through a two-week range of about 88 to 90, reaching 92.25, the weakest level since Jan. 8. The yen was at 116.56 versus the euro following a 1.5 percent decline. The euro traded at $1.2788 after reaching $1.2706 on Feb. 2, the lowest level since Dec. 5. The yen dropped 3.1 percent to 133.54 against the pound and 3.8 percent to 9.28 versus South Africa’s rand as a 1.6 percent gain in the Standard & Poor’s 500 Index encouraged investors to sell Japan’s currency and buy higher-yielding assets. Japan’s yen also weakened on speculation U.S. regulators will change an accounting rule governing assets banks hold, limiting their losses, according to Kim. Senate Banking Committee Chairman Christopher Dodd told reporters on Feb. 4 that the so-called mark-to-market rule might need to be changed temporarily. U.S. employers probably cut 540,000 jobs in January, following a reduction of 524,000 in the prior month, according to the median forecast of 75 economists surveyed by Bloomberg News. The Labor Department is scheduled to release the non-farm payroll report at 8:30 a.m. in Washington. The ruble declined to 41.02 against a target basket of dollars and euros yesterday, beyond the level of 41 that the central bank pledged to defend two weeks ago. The ruble may slide as much as 18 percent against the dollar by the middle of this year, Morgan Stanley said. Europe’s currency dropped 2.1 percent to 12.60 rand yesterday and 1.4 percent to 8.7621 Norwegian kroner on concern the slump in Eastern Europe may further drag down growth in the 16-nation region that shares the single currency. The euro dropped 1.5 percent versus the dollar on Feb. 4 after Fitch cut Russia’s debt rating. “The continued selling pressure on the euro is mainly driven by the problems in Eastern Europe,” said Adam Boyton, a senior currency strategist in New York at Deutsche Bank AG. ECB policy makers left the main refinancing rate unchanged at 2 percent yesterday, in line with the median forecast of 53 economists surveyed by Bloomberg News. The market may be “right” to bet on a reduction of a half-percentage point in March, while cutting to zero isn’t “appropriate at this stage,” Trichet told reporters following the decision. Investors added to bets the ECB will reduce borrowing costs again later this year. The yield on the three-month Euribor interest rate futures contract due in March fell to 1.76 percent yesterday, down from 1.84 percent a week ago. “Clearly there are more rate cuts to come,” said Richard Franulovich, a senior currency strategist at Westpac Banking Corp. in New York. “Europe is in a pretty deep hole. That will keep the euro under pressure.” Franulovich expected the ECB to lower rates to 0.75 percent by the end of the third quarter. The pound rose 1.1 percent to $1.4625 yesterday on speculation the Bank of England will suspend lowering borrowing costs after it reduced the rate by a half-percentage point to the lowest level in the bank’s 315-year history. FCPO 3rd month April Futures contract closed RM34 higher to close RM1879 as compare to previous trading session with 6904 lots traded in the market. CPO price was traded higher electronic trading for crude oil and soybean oil were holding firm. 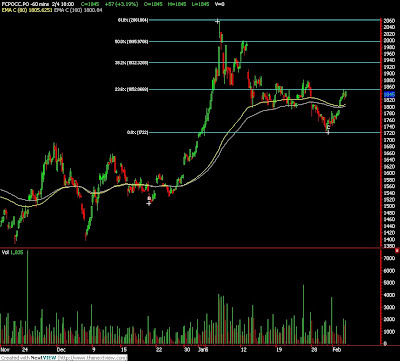 Technically, CPO price surge higher after manage to breach RM1850, 23.6% Fibonacci projection levels. Based on our technical analyst, we expect CPO price would trade higher in the coming trading session strictly provided if support levels at RM1800 and RM1720 were not violated. Traders were advise to hold long position in the coming trading session while be cautious around resistance levels at RM1933 and RM2000 region. FKLI February futures contract closed marginally 1.5 points higher at 877 as compare to previous trading session with total 4387 lots traded in the market. FKLI was traded sideways for 1st trading sessions but surge up few hours before market about to close. Technically, FKLI seem hold well above support levels at 865 and 870 regions during trading session despite encounter great selling pressure. We expect FKLI would trade high in the coming trading session. 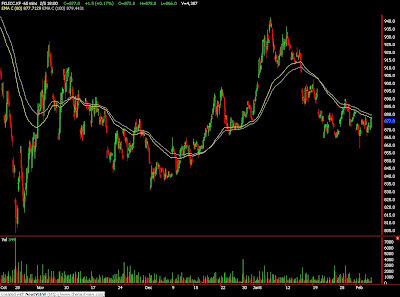 However, FKLI must be able to breach 80 – day and 100 – day moving average resistance levels at 880 regions. Traders were advice to hold long position in the coming trading session while be cautious around resistance levels at 884 and 900. MUMBAI, Feb 5 (Reuters) - Indian March soyoil futures reversed early gains and fell on Thursday afternoon following more tenders to import edible oil, but firm Malaysian palm oil and strong spot demand limited the drop. By 3:25 p.m. (0955 GMT), the March futures NSOH9 was down 0.49 percent at 448.20 rupees ($9.2) per 10 kg on the National Commodity and Derivatives Exchange. "Prices are under pressure as imports are still on despite availability of domestic edible oils," an official in the Soybean Processors' Association, a leading trade body, said. State Trading Corporation of India Ltd (STCI.BO: Quote, Profile, Research) on Thursday issued a tender for import of 12,000 tonnes of crude palm oil in February and March. Together, the state-run firms like MMTC Ltd (MMTC.BO: Quote, Profile, Research), STC Ltd and PEC Ltd have issued tenders to import 60,000 tonnes of edible oil since last week. Still, the February contract NSOG9 was up 0.29 percent at 460.30 rupees, while spot prices in the central city of Indore, a hub for soyoil trade, rose 1.21 percent to 41,800 rupees per tonne. MUMBAI, Feb 4 (Reuters) - Indian soyoil futures rose on Wednesday tracking firm Malaysian palm oil while recent price falls in the spot market spurred bargain buying. By 2:28 p.m. (0858 GMT), the February contract NSOG9 on the National Commodity and Derivatives Exchange was up 1.64 percent at 454.70 rupees ($9.3) per 10 kg. March futures NSOH9 had risen 0.98 percent to 447 rupees after falling nearly 7 percent in a week. Spot prices in the western state of Maharashtra, the country's second largest producer, rose 1.4 percent to 446 rupees per 10 kg as demand surged at lower prices. "There is some fresh demand in the spot market after prices fell in last one week," a soyoil and soymeal trader in Maharashtra said. The benchmark palm oil April contract KPOc3 on the Bursa Malaysia Derivatives Exchange was up 2.35 percent at 1,830 ringgit a tonne at 0901 GMT. FKLI February futures contract closed 6 points higher at 875.5 as compare to previous trading session with total 4089 lots traded in the market. FKLI was traded sideways during the trading sessions as lack of market leads from regional indices and Dow Jones futures electronic tradings. Technically, FKLI seems traded sideways during 1st trading session but manage to breach resistance levels at 874 in the 2nd trading session. 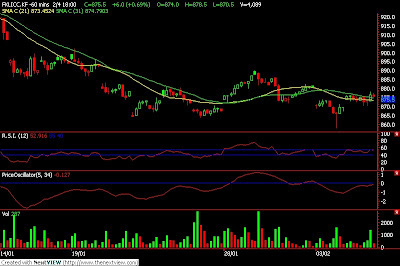 We expect FKLI would trade higher in the coming trading session provided if support levels at 865 and 858 were not violated. Traders were advice to hold long position in the coming trading session. Nearest resistance levels were seen at 884 and 900 regions. FCPO 3rd month April Futures contract closed RM57 higher to close RM1845 as compare to previous trading session with 6696 lots traded in the market. CPO price was traded higher as overnight and electronic trading for crude oil and soybean oil positive trading. 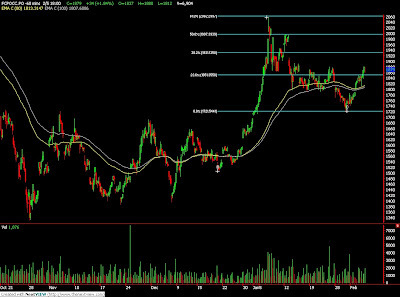 Technically, CPO price continue to surge higher after manage to hold well above support levels at RM1800. We expect CPO price would trade higher in the coming trading session with condition that support levels at RM1730 must not violate. Traders were advice to hold long position in the coming trading session while be cautious around resistance levels at RM1850 and RM1900 regions. Feb. 4 (Bloomberg) -- Gold rose for the first time in three days on demand for the precious metal as a store of value amid global financial turmoil. Silver also gained. UBS AG said today gold will average $1,000 an ounce this year, up 43 percent from its October forecast. Investment in the SPDR Gold Trust, the biggest exchange-traded fund backed by bullion, rose to a record 853.4 metric tons on Feb. 2. Gold futures for April delivery rose $9.70, or 1.1 percent, to $902.20 an ounce on the Comex division of the New York Mercantile Exchange. The price dropped 3.9 percent in the previous two days. Rising government debt needed to rescue banks will devalue all currencies and lead to inflation, UBS said. Demand for gold coins has picked up in the past two weeks in Europe, the bank said. London-based researcher GFMS Ltd. expects demand for gold bars to climb 49 percent to 201 tons in the first half. “We believe that higher gold prices will lift silver and platinum in sympathy,” John Reade of UBS said. Silver will average $14.75 in 2009, up from a forecast of $8.40, and platinum will average $1,050, up from $900, UBS said. Silver futures for March delivery gained 17 cents, or 1.4 percent, to $12.47 an ounce. The metal slumped 24 percent in 2008, while gold gained 5.5 percent. Platinum futures for April delivery rose $6.20, or 0.6 percent, to $969.70 an ounce on the Nymex. The metal gained 5.3 percent in January after falling 38 percent last year. Palladium futures for March delivery gained $5.05, or 2.6 percent, to $198 an ounce. The metal rose 2.4 percent last month after plunging 50 percent in 2008. Feb. 4 (Bloomberg) -- Crude oil fell after a government report showed that U.S. inventories jumped more than twice the amount analysts forecast. Supplies rose 7.2 million barrels to 346.1 million barrels last week, the highest since July 2007, according to the Energy Department. Inventories were forecast to climb by 3 million barrels, the median of 14 analyst estimates in a Bloomberg News survey. Prices rose earlier on signs OPEC is implementing a record production cut announced in December. Crude oil for March delivery declined 46 cents, or 1.1 percent, to settle at $40.32 a barrel at 2:48 p.m. on the New York Mercantile Exchange. Prices are down 9.6 percent this year and 55 percent from a year ago. The increase last week left stockpiles 15 percent higher than the five-year average for the period, the department said. The price of oil for delivery in April is $3.92 a barrel higher than for March. December futures are up $13.29 from the front month. This structure, in which the future month’s price is higher than the one before it, is known as contango, and is often an indicator of oversupply. Volume in electronic trading on the exchange was 409,576 contracts as of 3:01 p.m. in New York. Volume totaled 482,776 contracts yesterday, down 1.7 percent from the average over the past three months. Open interest yesterday was 1.25 million contracts. The exchange has a one-business-day delay in reporting open interest and full volume data. Supplies at Cushing, Oklahoma, where oil traded on Nymex is stored, climbed 2.5 percent to 34.3 million barrels last week, the highest since at least April 2004, when the department began keeping records for the location. “The Cushing storage situation should lead to increased volatility, especially near expiration, because of delivery concerns,” Edmonds said. Gasoline rose after U.S. supplies climbed less than expected last week. Inventories increased 362,000 barrels to 220.2 million in the week ended Jan. 30, the report showed. An 800,000-barrel gain was forecast, according to the Bloomberg News survey. Gasoline futures for March delivery climbed 5.14 cents, or 4.4 percent, to settle at $1.2184 a gallon in New York. Heating oil increased 0.16 cent to end the session at $1.327 a gallon. Regular gasoline at the pump, averaged nationwide, rose 1 cent to $1.90 a gallon, AAA, the largest U.S. motorist organization, said on its Web site today. Prices have declined 54 percent from the record $4.114 a gallon reached on July 17. U.S. fuel demand during the past four weeks averaged 19.5 million barrels a day, down 2.8 percent from a year earlier, the Energy Department report showed. Oil prices dropped after U.S. equities retreated as disappointing earnings at Kraft Foods Inc. and Walt Disney Co. triggered a selloff in consumer shares. The Standard & Poor’s 500 Index lost 0.8 percent to 832.23, erasing an earlier gain of 1.6 percent. Prices are “firming up” because of output constraint by the Organization of Petroleum Exporting Countries, and further cuts may not be necessary, Libya’s top oil official, Shokri Ghanem, said in an interview today. OPEC, supplier of more than 40 percent of the world’s oil, may not need to reduce output when it meets on March 15 in Vienna, Ghanem said. OPEC decided on Dec. 17 to trim production by 9 percent beginning on Jan. 1. The 12-member group pumped an average 28.565 million barrels a day last month, down 1.05 million from December, according to a Bloomberg News survey of oil companies, producers and analysts. Brent crude oil for March settlement rose 7 cents to $44.15 a barrel on London’s ICE Futures Europe exchange. Feb. 5 (Bloomberg) -- The euro may extend its decline against the yen and dollar on speculation the slump in Eastern Europe will cause the regional economic slowdown to deepen. The currency traded near an eight-week low versus the dollar on bets the European Central Bank will make further cuts in borrowing costs later this year. The ECB is forecast by economists to hold the target lending rate at 2 percent today. Kazakhstan devalued the tenge by 18 percent yesterday, and Russia’s ruble approached an 11-year low versus the dollar after Fitch cut the nation’s debt rating. The euro traded at 114.79 yen at 7:24 a.m. in Tokyo, after falling 1.5 percent yesterday. The dollar was little changed at 89.29 yen. The euro was at $1.2857 after declining 1.5 percent yesterday and touching $1.2706 on Feb. 2, the lowest level since Dec. 5. The 16-nation currency also fell against the dollar yesterday as the European Union’s statistics office in Luxembourg said retail sales fell 1.6 percent in December from a year earlier. The median forecast of 13 economists surveyed by Bloomberg News was for a decrease of 1.4 percent. The ECB will hold its main refinancing rate steady at a policy meeting today, according to the median forecast of 53 economists surveyed by Bloomberg. ECB President Jean-Claude Trichet reiterated last week that the next “important” meeting for policy makers will be in March. The Bank of England will reduce its benchmark interest rate today by a half-percentage point to 1 percent, according to a separate Bloomberg survey of economists. The dollar erased earlier losses against the yen yesterday after a report showed U.S. service industries contracted in January at a slower pace than economists forecast. The Institute for Supply Management’s index of non- manufacturing businesses, which make up almost 90 percent of the economy, rose to 42.9 from 40.1 in December. Readings below 50 signal contraction. The median forecast of 65 economists surveyed by Bloomberg News was for a decrease to 39. Kazakhstan followed Russia, Ukraine and Belarus in devaluing its currency, abandoning intervention to preserve reserves as local banks and companies struggled to refinance debt. Kazakhstan’s tenge weakened yesterday to 149.65 per dollar from 123.48 after the central bank said in a statement that the currency will trade at about 150. The ruble slid as much as 1.1 percent to 36.3515 per dollar yesterday, near the weakest since the currency was redenominated in 1998, after Fitch cut Russia’s debt rating for the first time in more than a decade. Fitch reduced the rating to BBB, the second-lowest investment grade. Poland’s zloty slumped as much as 1.4 percent to 4.6995 per euro yesterday, the weakest level since June 2004, on concern the economic slowdown is worsening and speculation the central bank won’t step into the market to support the currency. Economy Minister Waldemar Pawlak told public radio yesterday that trying to halt the zloty’s slide would be a mistake. MUMBAI, Feb 4 (Reuters) - Indian soybean and soyoil futures rose on Wednesday morning on short-covering triggered by a firm Malaysian palm oil market and expectations of revival in spot demand after prices fell in last one week, analysts said. Soybean futures have fallen more than 9.5 percent, while soyoil futures have fallen about 7 percent in a week to Tuesday. However, rains in Argentina, the world's third-largest exporter of soybean and edible oil imports by state-owned firms, may limit the gains, they added. At 10:39 a.m., March soybean NSBH9 on National Commodity and Derivatives Exchange was up 0.92 percent at 2,241 rupees per 100 kg. March soyoil NSOH9 had risen 0.69 percent to 445.70 rupees per 10 kg. Rapeseed, the main winter sown oilseed crop in India, also rose tracking strong oilseed complex. May rapeseed futures NRSK9 was up 0.62 percent at 452.80 per 20 kg. At 10:41 a.m., April palm oil KPOc3 on the Bursa Malaysia Derivatives Exchange was up 2.35 percent at 1,830 ringgit a tonne. Feb. 4 (Bloomberg) -- Asian currencies gained, led by the South Korean won, as a rally in global stocks and government support for financial markets bolstered demand for emerging- market assets. The won and Malaysia’s ringgit strengthened by the most in a week after the U.S. government said it will step up efforts to fight the recession. The Federal Reserve extended its foreign- currency swap lines with global central banks by six months through October, including a $30 billion facility with the Bank of Korea. Indonesia’s rupiah advanced after policy makers cut the benchmark interest rate for a third straight month. Korea’s currency climbed 1 percent to 1,375.85 per dollar as of 1:37 p.m. in Seoul, according to Seoul Money Brokerage Services Ltd. The ringgit appreciated 0.3 percent to 3.6100 and the rupiah gained for a second day to trade at 11,708, according to data compiled by Bloomberg. The MSCI Asia Pacific Index of regional shares rose 1.2 percent following yesterday’s 1.6 percent gain in the Standard & Poor’s 500 Stock Index. The yield premium that investors demand to hold emerging-market debt over U.S. Treasuries narrowed for a fourth day, according to JPMorgan Chase’s EMBI+ Index. Bond default risk fell in Asia, according to the Markit iTraxx Asia index of investment-grade borrowers outside Japan. The Fed extended currency-swap programs with the central banks of Australia, Brazil, Canada, Denmark, the U.K., the euro region, South Korea, Mexico, New Zealand, Norway, Singapore, Sweden and Switzerland. The Bank of Japan will consider an extension when its policy makers next convene, the Fed said in a statement yesterday. Korea’s currency has dropped 8.5 percent versus the greenback so far this year, after tumbling 26 percent in 2008, on concern that sliding exports will tilt the economy into its first recession since the Asian financial crisis in 1997. Exports slumped by a record 33 percent in January. Global funds bought more Korean shares than they sold for a sixth day, the longest run of net purchases in a month, according to Korea Exchange. The Kospi index of stocks added 2.1 percent. The yen traded at 89.58 per dollar in Tokyo from 89.44 in New York yesterday. The euro fell 0.2 percent to $1.3018 before a report that may show retail sales in the nations that share the euro slid for a seventh month in December. Taiwan’s dollar gained 0.1 percent to NT$33.675 after the economics ministry yesterday said it will offer tax breaks, subsidized loans and rent reductions on land to lure local investors back from China and create jobs. China’s yuan climbed 0.1 percent to 6.8331, approaching a three-week high, after the central bank pledged to stem big fluctuations in the exchange rate, fanning speculation it won’t weaken the currency to help exporters. The People’s Bank of China will keep the yuan relatively stable at “a reasonable and balanced level,” the Financial News reported, citing Governor Zhou Xiaochuan. The central bank today strengthened the yuan’s reference rate by 0.07 percent to 6.8348, the biggest increase since Dec. 17. Elsewhere, the Singapore dollar rose 0.5 percent to S$1.5078 against the U.S. currency and India’s rupee gained 0.3 percent to 48.6875. The Philippine peso strengthened 0.4 percent to 47.34 and the Thai baht climbed 0.1 percent to 34.93. FCPO 3rd month April Futures contract closed RM9 higher to close RM1788 as compare to previous trading session with 4744 lots traded in the market. CPO price was traded sideways in a uptrend price channel as soybean oil and crude oil electronic trading were traded wild. 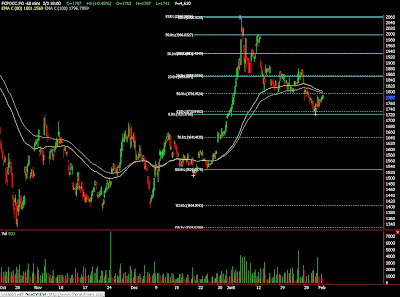 Technically, CPO price seem temporary supported above 61.8% Fibonacci retracement levels at RM1730 in the hourly chart. We expect CPO price would trade higher in the coming trading session despite great resistance levels were expect around RM1800 and RM1855 regions. Traders were advice to hold long position in the coming trading session while support levels at RM1750 and RM1730 must strictly guard. FKLI February futures contract closed 6.5 points lower at 869.5 as compare to previous trading session with total 5357 lots traded in the market. FKLI was traded lower in the coming trading session as regional indices were closed weak during the trading session. 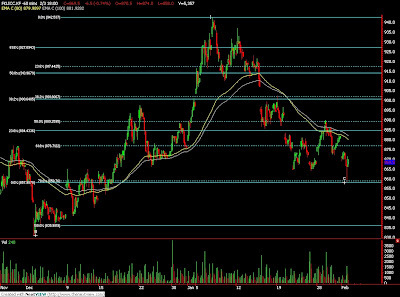 Technically, FKLI seems temporary supported above 78.6% Fibonacci retracement levels at 858 regions. There is no bullish signal seen in the hourly chart. However, we still expect FKLI would trade higher in the coming trading session provided support levels at 865 and 858 were not violated in the coming trading session. Resistances were seen at 884 and 900 regions. Feb. 4 (Bloomberg) -- The dollar may decline for a third day against the euro on speculation efforts to revive global economic growth will erode demand for the greenback as a haven. The U.S. currency weakened yesterday against most of its major counterparts as the Federal Reserve extended its emergency-lending programs and foreign currency-swap lines by six months, easing demand for dollar funding. The yen dropped versus the euro as U.S. stocks gained, encouraging investors to sell Japan’s currency and buy higher-yielding assets. “We are in the process of forming a bottom in the euro- dollar,” said Todd Elmer, currency strategist at Citigroup Global Markets in New York. The dollar traded at $1.3036 per euro at 7:24 a.m. in Tokyo, after falling 1.5 percent yesterday and reaching $1.2706 on Feb. 2, the strongest level since Dec. 5. The dollar was at 89.51 yen, after being little changed yesterday. The yen was at 116.63 per euro after dropping 1.5 percent. The U.S. currency fell 1.8 percent to 6.9119 Norwegian kroner and 1.6 percent to 1.1428 Swiss francs yesterday as the Fed said it was extending currency swaps with 13 other central banks through Oct. 30. The programs had been previously authorized through the end of April. The premium for swapping floating-rate, euro-denominated payments for those in dollars fell yesterday following the Fed’s announcement, signaling eased demand for dollar funding. The rate on a one-year cross-currency basis swap between euros and dollars was minus 53.4 basis points, compared with as much as minus 62.4 basis points on Feb. 2, the largest premium for dollar funding since Dec. 18. A negative swap rate signals that investors are willing to receive reduced euro interest payments to obtain dollar-based financing. A basis point equals 0.01 percentage point. The dollar rallied 15 percent versus the euro from September to October, partly as banks and companies sought the greenback to repay dollar debt after the collapse of Lehman Brothers Holdings Inc. seized up interbank lending. The yen fell 1.8 percent to 12.9378 versus the Norwegian krone yesterday as a 1.6 percent advance in the Standard & Poor’s 500 Index encouraged investors to resume carry trades, in which they get funds in a country with low borrowing costs and buy assets where returns are higher. Japan’s target lending rate of 0.1 percent compares with 3 percent in Norway. Japan’s central bank said yesterday it will buy 1 trillion yen ($11.1 billion) of shares held by financial companies, increasing the money supply. “The Bank of Japan’s purchases may also be aimed at staving off the exceedingly positive bias in the currency,” wrote Ashraf Laidi, the chief market strategist in London at CMC Markets, in a note to clients yesterday. Honda Motor Co. cut its full-year profit forecast by 57 percent last week as vehicle demand in the U.S. plunged and the yen gained 23 percent against the dollar in 2008, eroding the value of exports. Hungary’s forint tumbled yesterday as much as 2.4 percent to a record low of 303.19 versus the euro and extended this year’s decline to 11.6 percent on concern the economic slowdown will worsen. The Polish zloty slumped as much as 3.8 percent to 4.6720 versus the euro, the weakest level since June 2004. The European Central Bank will keep its main refinancing rate at 2 percent at a policy meeting tomorrow, according to the median forecast of 53 economists surveyed by Bloomberg News. ECB President Jean-Claude Trichet reiterated in an interview on Bloomberg Television at the World Economic Forum in Davos, Switzerland, last week that the central bank’s next important meeting is in March. The ICE’s Dollar Index, which tracks the greenback versus the euro, the yen, the pound, the Canadian dollar, the krona and the Swiss franc, lost 1.2 percent yesterday as a report showed more Americans signed contracts in December to buy previously owned homes, also reducing demand for the safety of the world’s reserve currency. The index of pending home resales climbed 6.3 percent to 87.7, the first increase since August, from 82.5 in November, the National Association of Realtors said yesterday. Feb. 3 (Bloomberg) -- Gold fell for a second straight day on speculation that a global slowdown will erode demand for all commodities. Silver and platinum also declined. The U.S. Senate is weighing an estimated $885 billion economic stimulus plan backed by President Barack Obama. A record 19 million U.S. homes stood empty at the end of the year as bank seizures outpaced sales, the Census Bureau reported. Gold’s gains in 2008 were the smallest since 2004. Gold futures for April delivery fell $14.70, or 1.6 percent, to $892.50 an ounce on the New York Mercantile Exchange’s Comex division. The price fell 2.3 percent yesterday, the biggest drop in three weeks. Gold rallied 5 percent last month as the Standard & Poor’s 500 Index lost 8.6 percent and the Reuters/Jefferies CRB Index of 19 raw materials dropped 4 percent. Investment in the SPDR Gold Trust, the biggest exchange-traded fund, or ETF, backed by bullion, rose to a record 853.4 metric tons yesterday. “Rapidly growing ETF holdings are a clear sign of safe- haven buying of gold,” said John Reade, a UBS AG analyst in London. Gold may fare better than other precious metals which have wider industrial applications as a global slowdown reduces demand for raw materials, analysts said. Gold may top $2,000 as the recession deepens, said Eric Sprott, who manages $4.5 billion at Sprott Asset Management Inc. in Toronto. The metal has risen for eight straight years and gained in five of the past six U.S. recessions. Most platinum is used in emissions-control parts for car and truck engines. Ford Motor Co. said U.S. sales fell 40 percent in January and Toyota Motor Corp. posted a 32 percent drop. Silver futures for March delivery dropped 11.5 cents, or 0.9 percent, to $12.30 an ounce. The metal slumped 24 percent in 2008 while gold gained 5.5 percent. Platinum futures for April delivery declined $15.60, or 1.6 percent, to $963.50 an ounce on Nymex. The metal gained 5.3 percent in January after falling 38 percent last year. Palladium futures for March delivery fell $5.50, or 2.8 percent, to $192.95 an ounce on Nymex. The metal rose 2.4 percent last month after declining 50 percent in 2008. Feb. 3 (Bloomberg) -- Crude oil rose on speculation that reduced OPEC production in January will curb global inventories and bolster prices. OPEC output averaged 28.57 million barrels a day last month, down 3.5 percent from December, according to a Bloomberg News survey of oil companies, producers and analysts. The United Arab Emirates and Qatar plan to extend reductions in crude-oil shipments in March, according to refiners. Crude oil for March delivery rose 70 cents, or 1.8 percent, to settle at $40.78 a barrel at 2:54 p.m. on the New York Mercantile Exchange. Prices are down 8.6 percent this year and 54 percent from a year ago. The Organization of Petroleum Exporting Countries, responsible for more than 40 percent of global oil supply, agreed on Dec. 17 in Oran, Algeria, to lower production as oil prices headed for their first annual decline since 2001. OPEC members with output quotas, all except Iraq, pumped 26.2 million barrels a day, 1.36 million more than their target of 24.85 million barrels a day, according to data compiled by Bloomberg. Saudi Arabia, OPEC’s biggest producer and the world’s top oil exporter, cut output by 375,000 barrels a day last month to an average 8.025 million barrels a day, the lowest since December 2002. Production was 26,000 barrels a day lower than its target of 8.051 million barrels a day, the Bloomberg survey showed. The U.A.E. and Qatar plan to reduce their crude oil shipments to Asia in March in line with OPEC cuts, said refiners who received notices from suppliers. State-owned Qatar Petroleum will slash supplies of its Marine grade sold under long-term contracts by 15 percent, following a 6 percent cut in February, said the refinery officials in Singapore, China, Japan and South Korea, who asked not to be named, citing confidentiality agreements. Abu Dhabi National Oil Co., the Emirates’ state-owned producer, will cut supplies of Murban oil by 10 percent after a 15 percent reduction in February, said the officials. Shipments of Upper Zakum grade will be reduced by 15 percent, Umm Shaif by 10 percent and Lower Zakum by 10 percent, similar to cuts in volume last month. OPEC production reductions have “stabilized” crude prices, halting a six-month decline, Algerian Oil Minister and former OPEC President Chakib Khelil told Radioprogramas, a Lima-based radio station today. Crude-oil prices will rebound in the third quarter because of rising demand, he said. OPEC may take “new measures” if present production cuts don’t result in an increase in oil prices, Portuguese news agency Lusa reported, citing OPEC President and Angolan Oil Minister Jose Maria Botelho de Vasconcelos. For Angola, an oil price of $75 a barrel “would already be very good,” Botelho de Vasconcelos said today, according to Lusa. The 12-member group’s next ministerial meeting is on March 15 in Vienna. U.S. crude-oil stockpiles increased 3 million barrels last week, according to the median of 13 analyst estimates in a Bloomberg News survey. The Energy Department is scheduled to release its weekly petroleum supply report tomorrow at 10:30 a.m. in Washington. The industry-funded American Petroleum Institute reported that U.S. supplies rose 8.13 million barrels to 346.2 million last week. The API published its weekly report on oil inventories at 4:30 p.m. in Washington today. The API moved release of its inventory data to Tuesday afternoons beginning last week. It had been issuing its reports on Wednesday mornings since 2003 to coincide with supply totals released by the government. The price of oil for delivery next January is 31 percent more than for the current month, increasing the opportunity for traders to profit from storing crude for later use. This structure, in which a future month’s price is higher than the one before it, is known as contango. Volume in electronic trading on the exchange was 392,505 contracts as of 3:02 p.m. in New York. Volume totaled 498,610 contracts yesterday, up 1.8 percent from the average over the past three months. Open interest yesterday was 1.26 million contracts. The exchange has a one-business-day delay in reporting open interest and full volume data. Falling prices and lower fuel demand have hurt energy company earnings. BP Plc, Europe’s second-biggest oil company, posted its first quarterly loss in seven years today. The fourth- quarter loss was $3.3 billion, or 18 cents a share, compared with net income of $4.4 billion, or 23 cents, a year earlier, London- based BP said today in a statement. Brent crude oil for March settlement increased 26 cents, or 0.6 percent, to end the session at $44.08 a barrel on London’s ICE Futures Europe exchange. Feb. 3 (Bloomberg) -- The yen fell, ending three days of gains versus the dollar and euro, after the Bank of Japan said it will buy 1 trillion yen ($11.1 billion) of shares held by financial companies, reviving demand for higher-yielding assets. Japan’s currency dropped from near a one-week high versus the greenback after the central bank said in a statement it will purchase the equities through April 2010 to boost the capital of financial institutions. The Australian and New Zealand dollars also ended a three-day losing streak against the yen after the Australian government said it will spend A$42 billion ($26.8 billion) to help prevent the economy entering a recession. The yen declined 0.3 percent to 89.72 per dollar as of 1:15 p.m. in Tokyo, from late in New York yesterday. The currency dropped 0.7 percent to 115.71 per euro. The euro traded at $1.2898 from $1.2843. The British pound fell to $1.4245 from $1.4264 yesterday. Against the euro, the pound slipped 0.5 percent to 90.51 pence. Australia’s dollar advanced to 57.57 yen from 56.49 yen in New York yesterday, and New Zealand’s dollar strengthened to 45.78 yen from 44.40. The yen remained lower after the Reserve Bank of Australia cut its benchmark rate by 1 percentage point to 3.25 percent at a meeting today. The rate decision was forecast by economists surveyed by Bloomberg. Australia’s spending package includes A$12.7 billion in grants from next month to families and low-income earners and A$28.8 billion for infrastructure. The package will help the economy grow 1 percent this fiscal year and 0.75 percent in the year ending June 30, 2010, government figures show. Benchmark rates are 3.25 percent in Australia and 3.5 percent in New Zealand, compared with 0.1 percent in Japan, encouraging investors to borrow in yen and buy higher-yielding assets elsewhere. In these so-called carry trades, investors get funds in a country with low borrowing costs and invest in another with higher rates. The risk is that market moves can erase those profits. The euro traded near an eight-week low against the dollar before a report that may show European producer prices fell for a fifth month, giving the region’s central bank more room to cut interest rates. Europe’s single currency may also pare gains versus the yen as prices of goods leaving euro-area factories probably dropped 1.2 percent in December after a 1.9 percent decline in November, according to a Bloomberg News survey of economists. The European Union statistics office releases the report at 11 a.m. in Luxembourg today. European Central Bank President Jean-Claude Trichet reiterated in an interview on Bloomberg Television at the World Economic Forum in Davos, Switzerland, last week that the central bank’s next important meeting is in March, signaling policy makers will keep the rate unchanged at 2 percent on Feb. 5. The pound fell for a second day versus the dollar and the euro on concern a U.K. report will show construction shrank last month at the fastest pace in more than a decade. The pound weakened versus 14 of the 16 most-active currencies as a U.K. index based on a survey of purchasing managers at building companies probably dropped to 29 in January, the lowest since the survey began in April 1997, a Bloomberg survey showed. The Chartered Institute of Purchasing and Supply and Market releases the data at 9:30 a.m. in London.